Escape to the beauty and history of the “Emerald Isle” on your guided tour of Ireland. Enjoy your getaway into the green valleys and sweeping seashores without the large crowds or costs of the “busy” travel season. You’ll begin in the fair city of Dublin. Admire statue-lined O’Connell Street, Dublin’s main thoroughfare, and elegant Georgian squares with their red-brick townhouses and colorful doors behind the wrought-iron fences. You’ll also see Trinity College and St. Patrick’s Cathedral along the way. Leave the bustle of Dublin for the green landscapes of Ireland’s countryside, and visit Rathbaun Farm. You’ll learn about Ireland’s sheep-farming practices, and try your hand at scone baking in the farmhouse kitchen. You’ll travel on to western Ireland’s colorful harbor city of Galway, with its vibrant shops, cafés, and traditional pubs. On your way to Northern Ireland, pass through Westport, Donegal, and Letterkenny. Then, enjoy a guided walk on Derry’s Old Town walls, and visit the amazing natural formation of the Giant’s Causeway—massive interlocking basalt columns that dramatically extend across the seashore. Spend two nights in Belfast, with plenty to see in Northern Ireland’s capital city, including the fascinating Titanic Experience. On your way back to Dublin, stop in Carlingford. This Cooley Peninsula town is famous for its oyster farms, medieval buildings, and 12th-century King John’s Castle overlooking the city. Spend the last night of your escorted tour of Ireland where you began, in Dublin. You’ll see why this escape through Ireland’s beauty and history is made even better without the crowds of the high season on your affordable, guided Ireland vacation. DAY 1 ARRIVE IN DUBLIN, IRELAND. 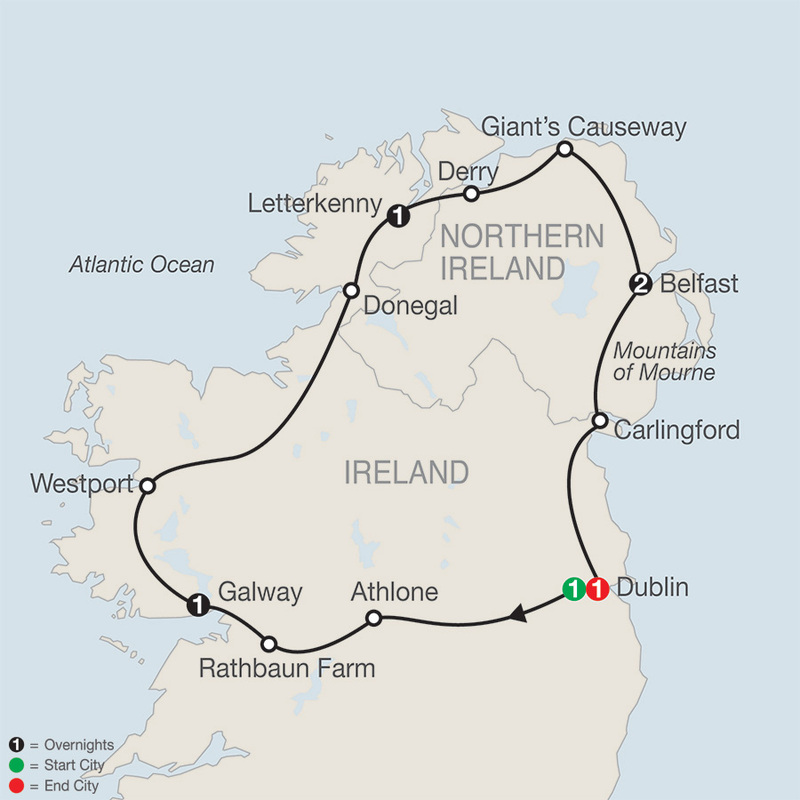 DAY 4 LETTERKENNY–DERRY, NORTHERN IRELAND–GIANT'S CAUSEWAY–BELFAST. The newly refurbished North Star Hotel is conveniently located in the heart of Dublin's City Centre. The hotel property boasts 160 exceptionally appointed guest rooms and suites offering every amenity to ensure a comfortable and luxurious stay for all guests. This central Dublin hotel is the ideal location for corporate or leisure stays in Dublin. It is on the doorstep of a host of Dublin tourist attractions within walking distance. You are guaranteed the best of all worlds when you stay at the luxury 4 star Galmont & Spa Galway. One of the finest Galway Hotels with scenic Galway Bay views, luxury city center hotel accommodation, excellent food and world class spirit one spa & leisure facilities. The 4 Star Clanree Hotel is perfectly located near stunning coastal drives, beaches and signature discovery points of the famous Wild Atlantic Way. The Aileach restaurant in the Clanree offers award winning food and is popular with locals and guests alike. The hotel boasts a fully equipped health and fitness club with a heated indoor 20m pool. The newly opened hotel is located right in the heart of Belfast city. Within walking distance there are shops, restaurants and historic landmarks making this hotel the perfect location for exploring Belfast.